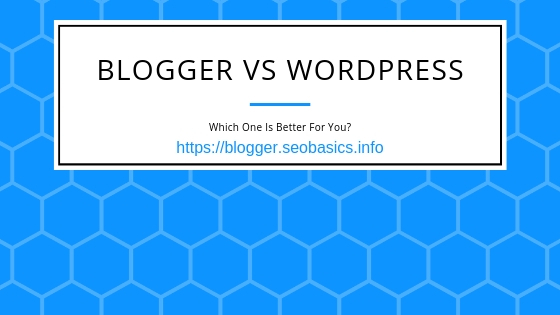 Blogger vs Wordpress: What's the difference between them? Is Wordpress better than Blogger? Read this Article to Understand Which is Better for You! What's the difference between Blogger and WordPress? For years now I use Blogger for my own websites, and I can confirm that Blogger is a great platform when it comes to building websites and blogs that are managed from one person or small sized teams. There are a lot of myths when it comes to Blogger and mostly those come from people that don't have a clue about Blogger blogs, or they have used these platform only for spam or to create backlinks to their main websites. It depends on a lot of factors! For example, if you are creating a company website and/or blog than I would recommend you use Wordpress because it has a lot more features than Blogger. Although even Blogger can be customized and you can create company websites with it. If you are creating a personal blog, or better saying your aim to create a small blog than Blogger can be good. Wordpress can be easier and better customized, you have more premium templates. I have used and use also Wordpress for a lot of websites, and Wordpress is an amazing CMS. Wordpress is better for a lot of people because it is easier to use with the help of a lot of different plugins and there are a lot of themes available. If you want to use Blogger to create good websites and optimized for search engines, you need to know basic HTML and CSS and create custom templates or you can buy premium Blogger templates for a cheap price. Blogger's own templates are not optimized for SEO, but then again even free templates for Wordpress are not great either. Yes, Blogger is a completely free blogging platform provided from Google, and with a little effort, you can create amazing blogs and websites from this great platform. Is Blogger good for SEO? When it comes to SEO for Blogger the only drawback I can see for On-Site SEO right now is that you cannot format URLs and create them without year and month, like you can format them in Wordpress. Anyway, Blogger as a blogging platform from Google is safer when it comes to security, because is hosted in Google servers, and also their servers never go down. When you start blogging, any platform that can create optimized posts for search engines, that can provide great user experience, can be a powerful money making platform. But if you are going to make money or not, it mostly up to you and not to the CMS you use. A lot of people make money from their websites on very different platforms. To make money from your website it doesn't matter if you are using Blogger or you are using Wordpress, or any other CMS for your website, but there a lot of other factors that matter. To make money you need traffic then you need to have a high converting website for that traffic, etc. You can achieve this with almost all type of CMS, for your website, you only need to know how-to! Anyway, I hope this article has helped you to make a choice when it comes to choosing the right platform for you. You are welcomed to express your opinion on this article! To do it use the real-time comments form belove.